The town of Gilbert, AZ is an attractive place to live, especially for families. Being in close proximity to Phoenix makes it ideal for commuters to settle down, while its exceptional school districts make it a great choice for families with children. There is so much to do in and around Gilbert: you can visit parks, splash pads, the historic downtown district, play ball, ride bikes and so much more. But at the end of the day, where do you put all your stuff? Right-in your garage. If your garage looks like most garages in Arizona, it is probably a cluttered and unorganized mess. 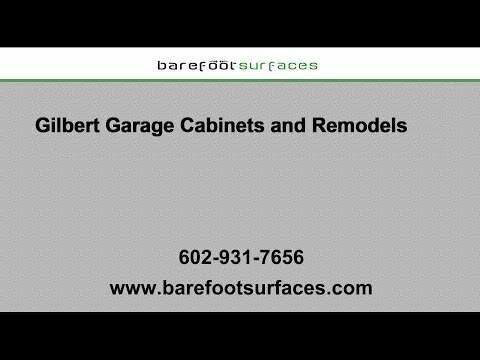 Gilbert Custom Garage Cabinets by Barefoot Surfaces can help. We provide sleek and affordable storage solutions for your garage, custom designed with your style and needs in mind. Barefoot Surfaces has been providing top quality customer service and high quality custom garage cabinets to Gilbert and surrounding areas for many years. Ric Ramirez, owner and operator of Barefoot Surfaces, has extensive experience in remodeling garages and creating useful spaces. Our Gilbert team takes its time to get to know our customers’ needs and to offer helpful advice in the construction and design process. We strive to turn your Gilbert Garage in a clean, well-organized and useful space; one that you might even park your car in. Barfoot Surfaces is an authorized dealer of Slide-Lok products. We understand that if you want to do quality work, you have to work with quality components and we are big fans of the look and the performance of Slide-Lok products. We can help you to choose the perfect cabinet model and set-up for your garage. Choose from the Tech or the Classic Series or even add optional shelving and drawers to achieve the look you desire. With Slide-Lok you can be certain to have a quality cabinet that is made of plywood and never particle board. Remodel Your Gilbert Garage Today! No more excuses! Our stylish and affordable cabinet and flooring options make it possible for you to get the garage, you have always dreamed off. Get yours today! With our great custom garage cabinet systems, every tool and outdoor item, has its place. No more sorting through piles of bicycles and roller skates. Goodbye clutter and chaos! Additionally, our cabinets protect your valuables from the elements, pests and unauthorized access. Call Barefoot Surfaces today and learn more about the many options available to you. To give your Gilbert garage a modern and cohesive look, ask us about our concrete garage floor coatings. No matter if you are looking for durability or style, or both combined, we have the floor coating for it. Prevent your garage from becoming that overlooked space in your home. Barefoot Services is your garage remodeling expert in Gilbert, AZ. With over 20 years of experience in the business, you can be certain that we will deliver a quality transformation for your garage. To learn more about our Slide-Lok products and garage remodeling options, including our Gilbert concrete garage floor coatings, call us today at 602-931-7656 or email Ric at Ric@barefootsurfaces.com. When we are done with your garage, you will wonder why you waited this long!